A sit-down cabinet with a 29" cabinet. 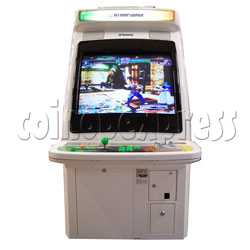 This cabinet has many features designed to accommodate all arcade games. Those features include a CGA/EGA/VGA compatible monitor. The ability to supply 5V or 12V. As well as 3.3V for Sega Naomi Game Boards. Also sound is switchable between Mono and Stereo sound. This cabinet as a bonus feature can also accept a VGA signal from a computer.